Before this year, I’d never grown a cauliflower. It’s one of those vegetables that, rumour has it, is very tricky to grow – and consequently I’ve never tried! After my abortive attempt at Romanesco last year, though, I thought I’d give cauliflower a whirl – not least because I’d received a free packet of Cauliflower Snowball seeds with my pack of goodies accompanying the bumper Gardener’s World edition that comes out with the 2-for-1 garden visit card each spring. I sowed them at the end of May, as I do all the brassica tribe: a late May sowing gives them time to germinate in seed trays, before pricking out a month or so later, then planting in their final positions down at the allotment at the end of July/early August at the latest, when the broad beans/early potatoes come out of the ground and free up some beds. This year, my brassicas included old stalwarts purple-sprouting broccoli and cavolo nero (kale), plus calabrese and the new kid on the block (to me at any rate), cauliflower. I always net my brassicas to protect them from the dastardly pigeons at the allotment – and if I can I use Enviromesh too in a bid to thwart the even more pervasive cabbage white butterflies. Inevitably some get through, so you always have to be on the lookout for caterpillars when you harvest homegrown calabrese and cauliflowers – added protein! After the failure of the Romanesco last year, I was amazed when I lifted a corner of the Enviromesh tunnel a few weeks ago to check on the plants and found sizeable heads of cauliflower and calabrese. Success! Unfortunately, as is often the way, they are all ready at once, so I’ve been giving them away to family and friends – and using them in my own kitchen, of course. Blitz the cauliflower in a food processor until rice-like (you may need to do this in two batches) and microwave for 4 minutes, then tip onto a clean tea towel, cool slightly, then squeeze out all the water (I save the juice for stock – or for the soup below!). 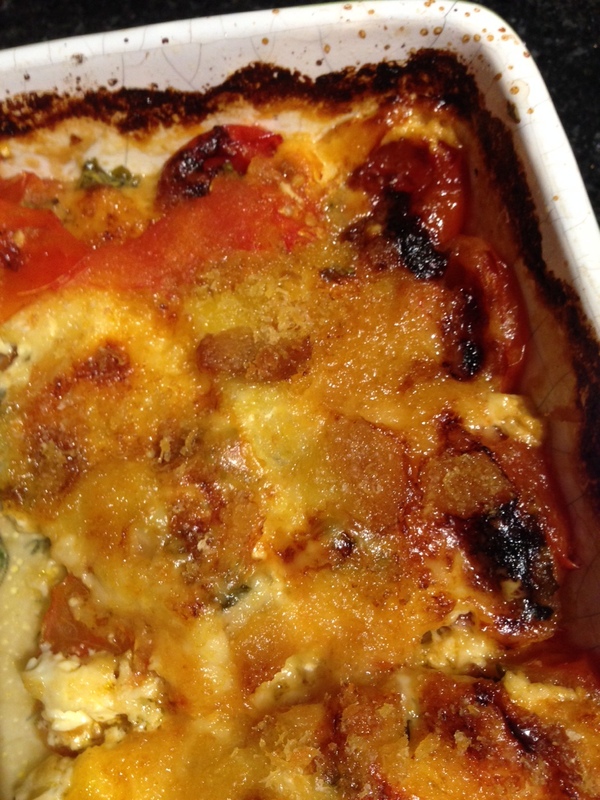 Mix with the ground almonds, 1 egg and the oregano and pat out on a greased baking tray. Cook for 15 minutes at 200°C. Meanwhile make a tomato sauce by gently frying the onions and garlic until softened, add the tomatoes, sugar, tomato purée and basil and cook down for 15-30 minutes until a nice, thick consistency. Slice the aubergine thinly and grill the slices in batches under a hot grill, brushed with olive oil, turning as the first side browns. Spoon the tomato sauce onto the cooked pizza base, add the grilled aubergine slices and top with grated Cheddar cheese and a drizzle of olive oil. Return to the oven for a further 10-12 minutes. Eat hot – and marvel at how the crust mimics a standard pizza base and really doesn’t taste like cauliflower – amazing! And delicious, needless to say! The discovery of my cache of cauliflowers happened to coincide with a few chillier days, so making soup seemed like a good idea. I’d made Broccoli & Stilton Soup before, with great success, but never cauliflower, and my usual scouring of the recipe books and various online sources didn’t yield quite what I had in mind. The end result was a cobbled-together mix of various recipes, mainly Jamie Oliver and Nigel Slater. It certainly hits the spot. Cook the chopped onion, celery, carrot, potato and garlic in butter for about 10 minutes until softened. Add the cauliflower and continue to cook gently for a further 15 minutes or so. Add the vegetable stock, bay leaves, seasoning and grated nutmeg, bring to the boil and simmer for 20-30 minutes until the vegetables are soft. Stir in the mustard. Allow to cool slightly, then whizz in a blender, in batches, until smooth, and transfer to a clean pan. At this stage you can add milk if the consistency is thicker than you’d like. Stir in the grated cheese and warm gently before serving with fresh bread. Freezes beautifully, like most soups – if anything, the flavour is often even better after a spell in the freezer! I can barely believe that September has flown past and here we are in October, summer definitely over, yet the gardens are still overflowing with beautiful produce. The weather is still being kind to us, at least down here in the South-East, so my (late) sweet peas are still going strong, as are the dahlias, and the courgettes are still producing chunky fruit every couple of days! There’s definitely a chill in the air, though, certainly in the morning and evening, and the leaves on my scarlet Euonymus alatus are just starting to turn – a sure sign that autumn has arrived. The late start to the growing season this year has meant that some crops haven’t done as well as usual: my squashes are very small, for instance, and the runner beans have been sketchy, although the French beans have been magnificent! My two plum trees were cut back hard last year and tend to be biennial in any event, so I haven’t had vast amounts of fruit, but the later Marjorie variety has come up trumps with a few bowls’ worth of sweet and juicy plums. Starting with the sliced onions, garlic and pepper, I gradually add the remaining veg as I prepare them by chopping roughly, then simmer for an hour or so. The taste of summer… Freezes beautifully, of course. After the last couple of chillier nights, I removed all the remaining tomatoes from my outdoor plants this morning and have left them in baskets to ripen on the conservatory windowsill. I’ve done the same with some of my triffid-like chilli plants too. This year’s variety, the jalapeno-like Summer Heat, has been very tasty (if pretty hot! ), but with very large fruit and leggy plants – not necessarily ideal on the conservatory window ledge! Fortunately, the allotment is still full of veg for the coming months: leeks, brassicas, beetroot and parsnips are all yet to come – the joys of growing your own! My new autumn raspberries have taken well in their new bed and I’m picking a handful every couple of days – perfect with my breakfast muesli and yogurt. Apples are looking plentiful too and one of this weekend’s tasks should certainly be to harvest as many as I can for storage in the garage before the first frosts. 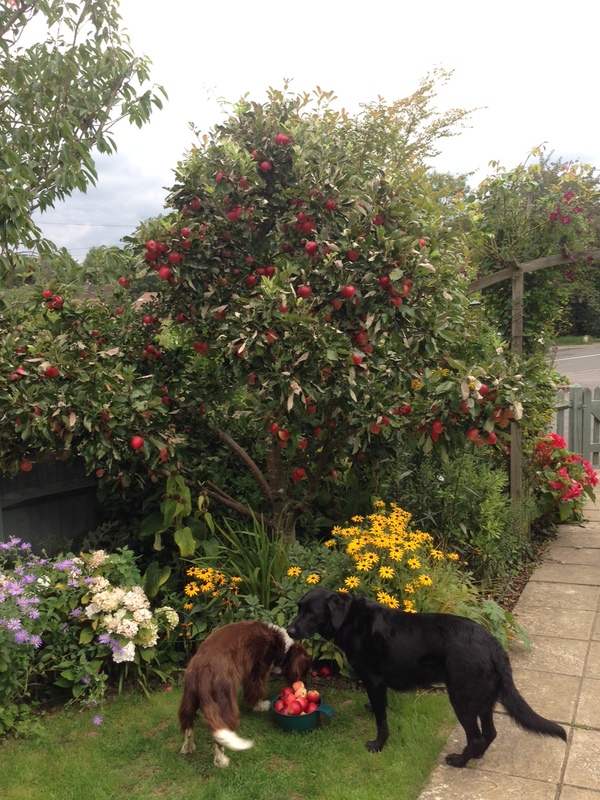 Such a lovely time of year…. Grease an 8″ solid-bottomed cake tin – I use a heavy tarte tatin tin. Put 4 1/2oz sugar and 3fl oz water in a small pan and simmer gently until the sugar dissolves. Increase the heat and cook to a golden caramel colour, watching like a hawk so that it doesn’t burn! Remove from the heat and add 2oz butter, stirring well. Pour into the prepared cake tin and place the plum halves on top, cut side down. Beat the remaining butter and sugar in a large bowl until light and fluffy, then gradually mix in the beaten eggs and vanilla extract. Add 1-2 tbsp flour if it shows signs of curdling. Then fold in the dry ingredients, alternating with the milk. Spoon the mixture onto the plums and bake for 45-50 minutes at 160°C / Gas 4 until golden brown, spongy to the touch and a skewer comes out clean. Cool for a few minutes, then, while still warm, run a knife round the edge of the cake, place a large plate on top of the tin and firmly but gently turn the whole plate and tin upside down. Shake a little and the cake should just turn out of the tin onto the plate. If any plums stick to the tin, just gently transfer them to their position on the cake. Sprinkle with toasted flaked almonds if you like. Serve warm with cream or crème fraiche for a delicious dessert or cold as cake – delicious either way! Incidentally, I’ve also made this with gluten-free self-raising flour (Dove’s Farm) and it worked a treat – worth remembering! Dried pulses, and especially lentils, are an essential part of my store cupboard and really come into their own in the winter months, when fresh vegetables aren’t quite as vibrant or plentiful. I love lentil soups, such as Tomato & Lentil, or Carrot & Lentil, and often throw a handful of lentils into chicken broth or good old vegetable soup for extra body and protein. They’re pretty cheap too – a pack of dried red lentils or beans lasts for ages and is very reasonably-priced. The more exotic Puy lentils are even more delicious, holding their shape better when cooked to a slurry with herbs and lemony flavourings as an accompaniment to smoked fish or as part of a rich and wholesome sausage casserole – perfect winter comfort food! Hugh Fearnley-Whittingstall’s take on Sausage and Puy lentil casserole is particularly scrumptious, although I prefer it with dried apricots rather than prunes (shades of school dinners…). One of my favourites is a lentil curry I came across in my first ever (Tower) slow cooker manual, over 30 years ago now. I still have the book (taped together! 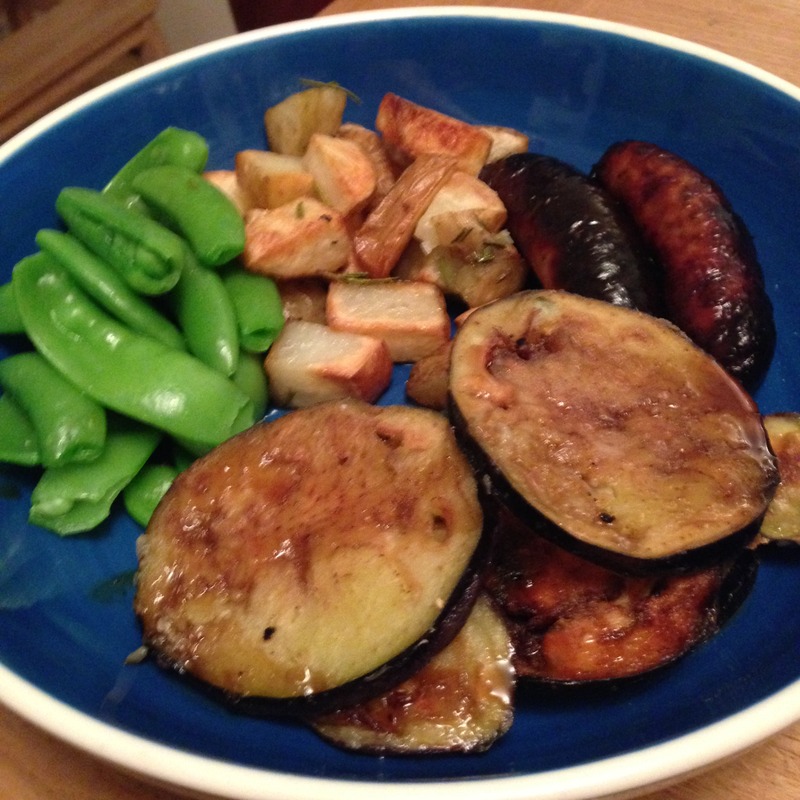 ), but I’ve adapted the recipe to suit our growing taste for spices and added extra vegetables over the years. 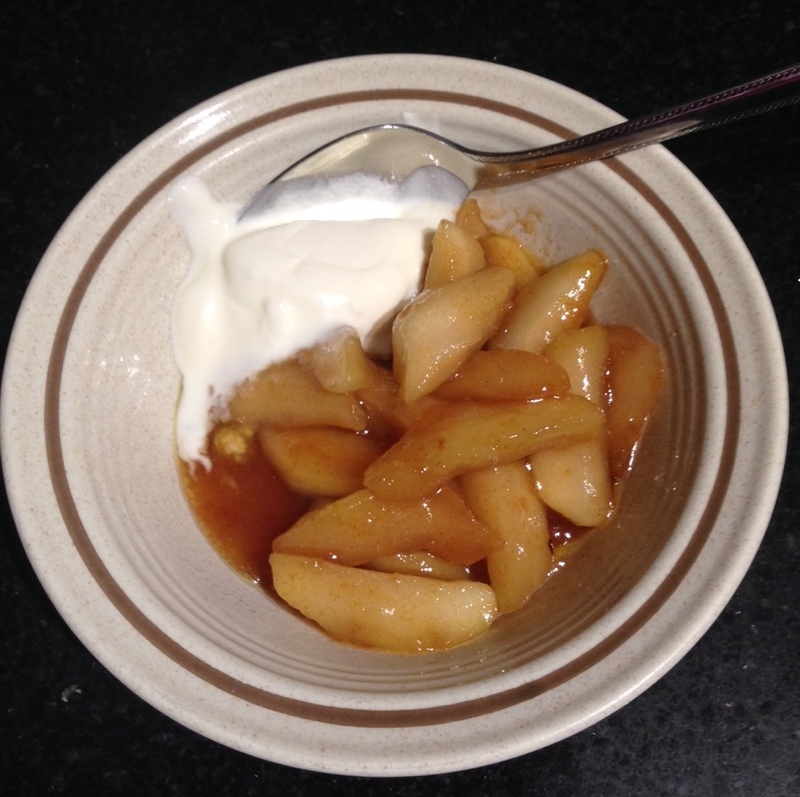 I still make it in my slow cooker (not quite the same one; I managed to drop the earthenware bowl and ended up buying a whole new slow cooker), but it must be 25 years old now and still going strong – and as useful as ever! Such a lovely feeling to put it on in the morning when you know you’re going out all day, then return home to a lovely hot meal and the knowledge that you don’t have to cook (much as I love it usually!). Brilliant for chilli con carne, sublime for brisket of beef or a slow-braised ham joint with cider, apples and celery…. or equally good for mulled wine, steamed puddings (especially Christmas pudding!) and crème caramel! And of course, I always use it to make my stock with the cooked chicken carcass, onion, celery, chilli, herbs, vegetable cooking water and seasoning, left over night – perfect! A friend says she pre-cooks her pulses in the slow cooker after soaking them – I haven’t tried that, I must admit, but it sounds like a great idea. Anyway, about that lentil curry. You can adjust the chilli content to suit your own taste: the first time I served this to one of my sons’ schoolfriends when he came to dinner soon after we moved south, he maintained it was REALLY hot, yet we find it quite mild using 3 or 4 home-grown Apache chillis (seeds included). If you know you’re averse to hot spices, or you think your chillis may be very hot, adjust accordingly. It’s hard to take them out after the event! Heat a good glug of oil in a pan and cook the onion and garlic for about 10 mins until softened. Add chopped carrots, celery, pepper, apple and leek, then add chopped chilli, spices and stir for a few mins until well coated. Add lentils and cook for another few minutes. Add tomato purée and stock, then season well. Bring back to the boil and cook for 10 minutes before adding a handful of sultanas. Transfer to the slow cooker for 7-10 hours on Auto/Low (3-4 hours on High). Serve with chopped coriander If you have it! Otherwise parsley or baby spinach work well…) and natural yogurt with rice or Naan. Freezes beautifully! 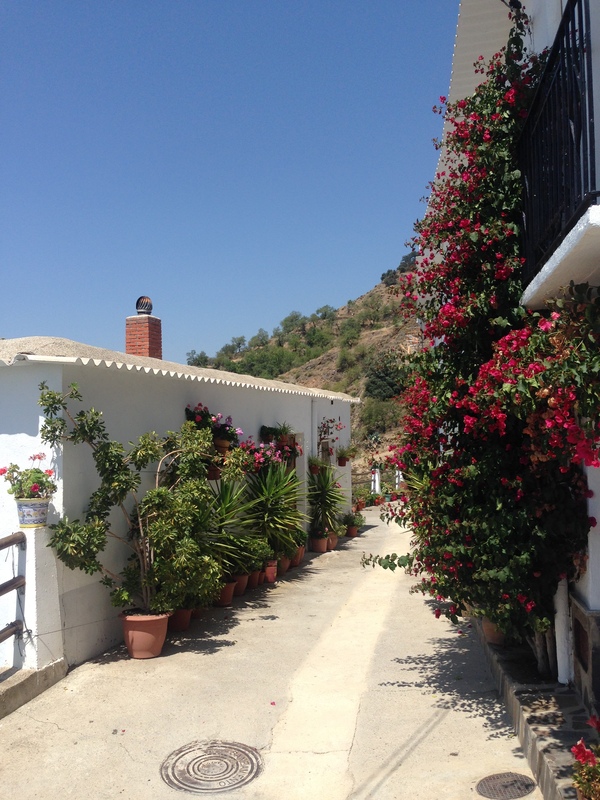 I’m newly returned from a fabulous yoga holiday in the Spanish Alpujarra mountains, where we practised yoga in the olive and orange groves to the sound of cicadas and golden orioles – bliss! The food on offer was vegetarian, as befits a yoga holiday, and cooked by local Spanish ladies from the hill village of Mairena – all absolutely delicious. Back home, my allotment and garden are overflowing with produce and I find I’m inclined to continue the vegetarian diet – why eat meat when there’s so much produce to experiment with? 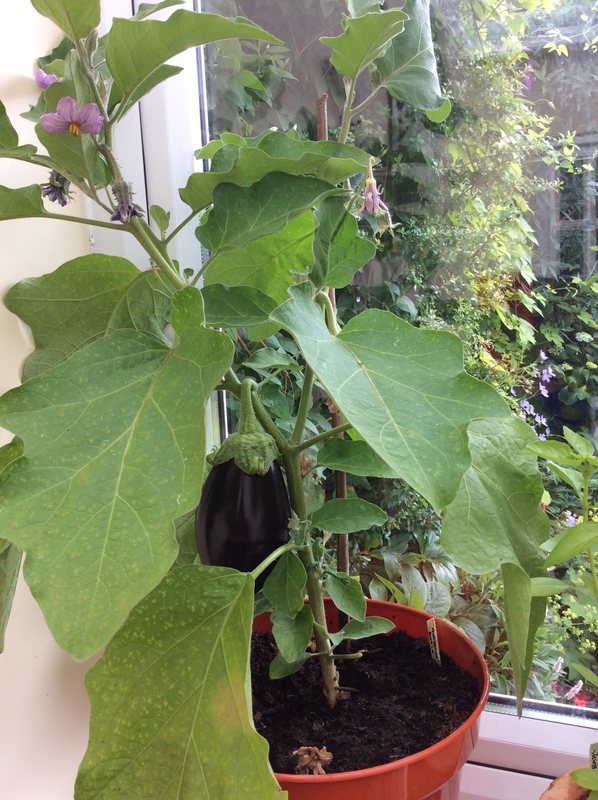 Much to my surprise, my aubergine plants, grown from seed (Bonica), had two huge aubergines perfect for picking the week I arrived back – much better than the grafted specimens I bought at great expense last year. 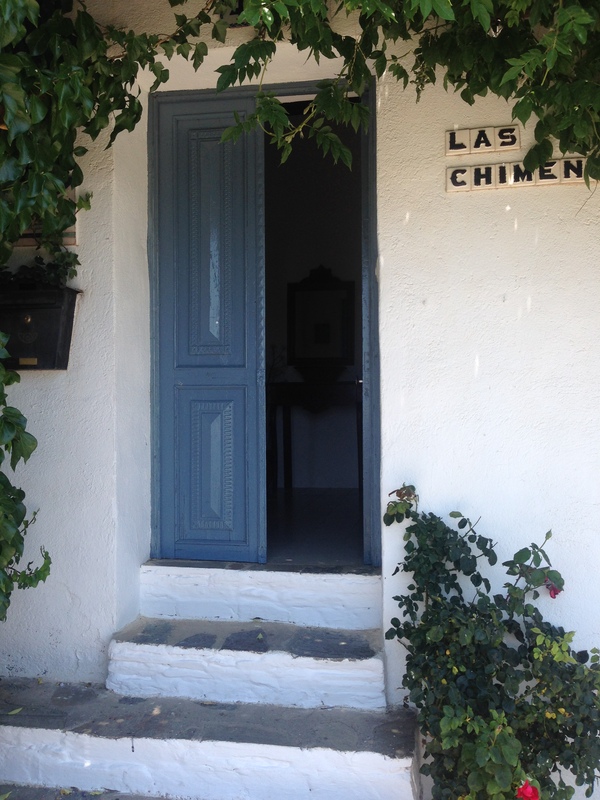 We’d had a delicious aubergine recipe at Las Chimeneas whilst I was away, subsequently demonstrated in a fascinating local cookery session and we’d all been issued with the recipe, so this seemed the perfect opportunity to try my Spanish cookery skills! My version is slightly adapted from the original to suit the contents of my kitchen, but I’m assured that Soledad, the cook, changes it every time too! Cut the aubergines in half lengthways, leaving the stalk end intact, brush the cut sides with olive oil and bake them on a baking tray in the oven for 20-25 minutes at 180°C, Gas 5, until soft. Allow to cool, then scoop out the soft flesh and put to one side, leaving the skins intact. Meanwhile, fry the chopped onion and garlic until soft in the olive oil. Place the walnuts on a tray and cook in the oven for 5-7 minutes until starting to turn golden brown, then crush lightly in a pestle and mortar – not too fine. Grate the tomatoes (ingenious – I’d never thought of doing this, but it saves the effort of skinning them as you discard the last piece of skin!) and add to the pan with a squeeze of tomato purée (needed to compensate for the tomatoes available in the UK at this time of year compared with the flavoursome Spanish varieties… mine won’t be ready for a few weeks and hopefully will make the world of difference). Chop the aubergine flesh and add to the mixture with the crushed walnuts, chopped basil and half the grated cheese, then season well. Remove from the heat and stir in the beaten egg. 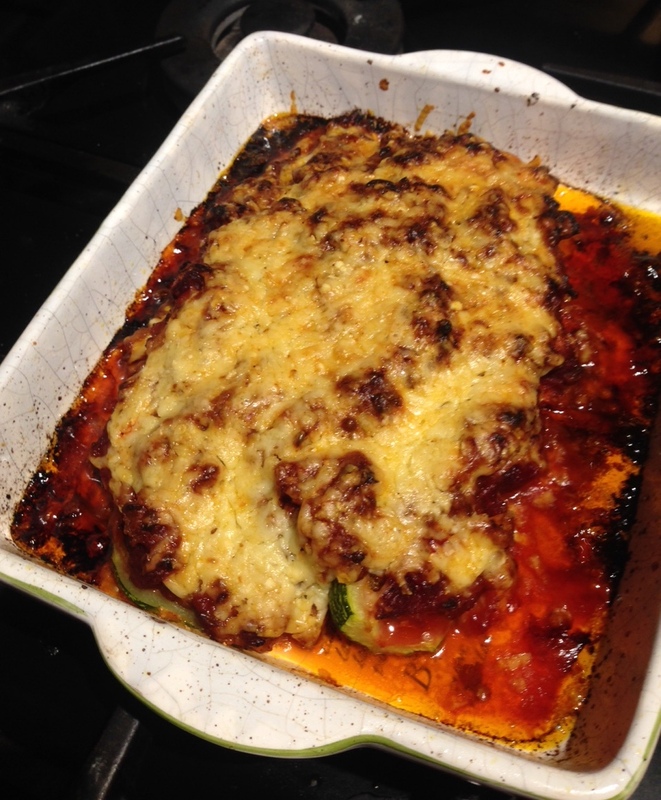 Fill the mixture back into the aubergine skins, sprinkle with the remaining cheese, and return to the oven for 20 minutes to cook through and brown. Serve with a salad and rice, or just with griddled courgettes served with chopped mint and lime, as I did. Enjoy! 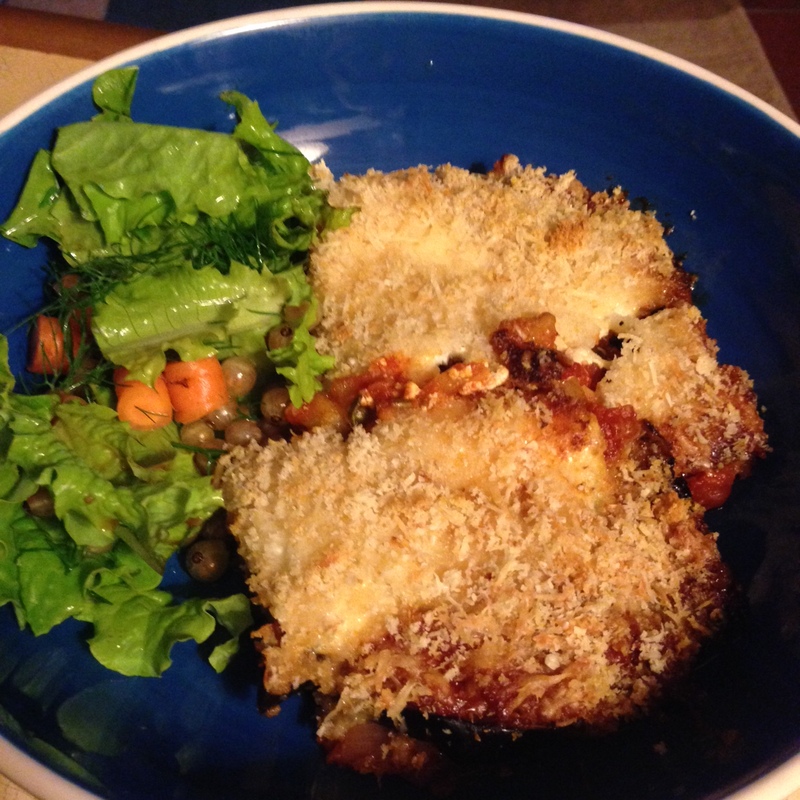 Another old favourite of mine is Aubergine Parmigiana, based on a recipe in an ancient M&S cookbook dating back to the early 80’s! 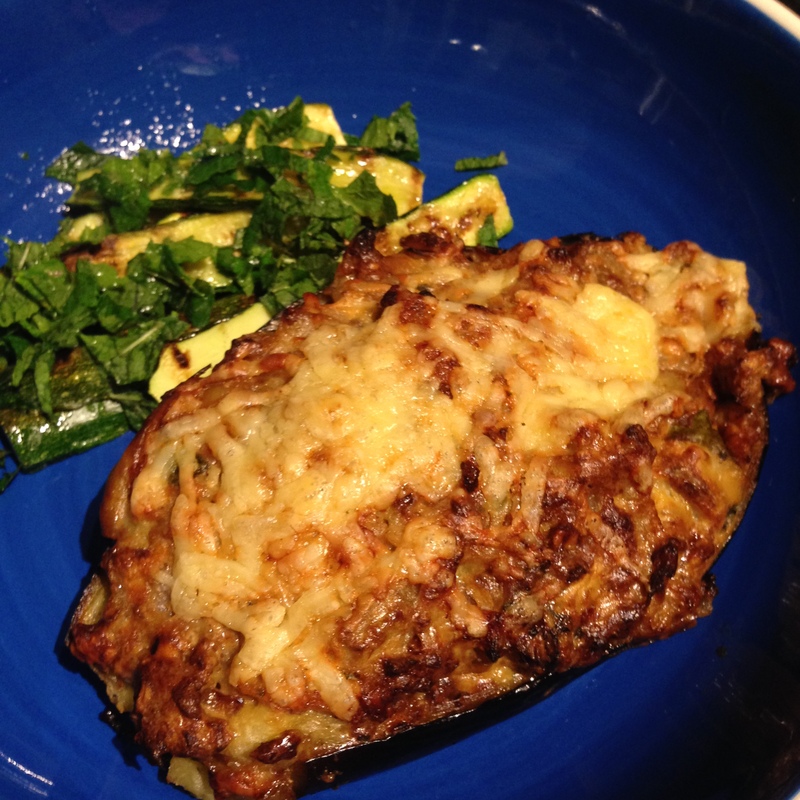 Aubergines were doubtless very new-fangled in the UK in those days, usually seen in moussaka, but this recipe has always been one of my stalwarts. Slice the aubergines crosswise and place the slices on a foil-lined grill pan, then brush with olive oil. Grill until starting to brown, then turn over with kitchen tongs, brush the other side with oil and grill again. Transfer to a tray lined with kitchen paper to absorb any excess oil and repeat with the remaining aubergine slices. Meanwhile, fry the onion and garlic in olive oil until soft, then add the tomatoes, tomato purée, sugar, chopped basil and seasoning. Cook for 15 minutes or so until well blended. Place half the aubergine slices on the bottom of a rectangular gratin dish and cover with half the tomato sauce and half the yogurt. Repeat these layers, then top with the cheese and breadcrumbs, mixed together. Cook in a hot oven, 180°C, Gas 5 for 30 minutes until golden brown and bubbling. Serve with salad. Any leftover heats up well for lunch the next day. My final recipe is based on a delicious dish I had in the famous El Pimpi tapas bar just round the corner from the Picasso Museum in Malaga. My companion and I sat at the bar in traditional fashion and had the most delicious selection of tapas: berenjenas con miel de caña, tortilla and a mixed salad – food fit for the gods! These translate as aubergines with sugar cane syrup – or molasses, I suppose. I nearly gave it a miss as I can’t stand honey (miel), but someone had kindly explained that this was sugar cane “honey” – no bees involved! I used pomegranate molasses, but you could probably use maple syrup instead. Slice the aubergine into 1 – ½ cm slices. Place the slices on a baking tray and lightly salt on both sides. Leave for at least 30 mins to an hour to draw out the moisture, then rinse and pat dry with kitchen roll. (I don’t usually think this “disgorging” process is necessary with modern breeds of aubergine, which aren’t bitter, but for this recipe it seems like a good idea to ensure the flour sticks). Heat the oil in a large frying pan over a medium heat. Tip the flour onto a large plate and season with salt and pepper. Coat the aubergine slices in the flour and press down, turn over with tongs and coat the other side. When the oil is hot (it should sizzle when you put the slices in), lift the slices with tongs, shaking off the excess flour, and place in the oil. Cook for about a minute on one side until golden brown and then turn over with the tongs and do the same on the other side. When cooked on both sides remove to some kitchen roll to drain. Continue until all the aubergine is cooked. Arrange the slices overlapping in one layer on a large serving dish/platter and drizzle generously with the molasses. Serve immediately with extra molasses/syrup on the table. A sublime and quite unexpected combination!